O’Shea’s Las Vegas Casino has been a bizarre contradiction for its entire existence, so it is no surprise that the casino’s impending shuttering on April 30 seems both too soon and not soon enough. Anachronistic and out of place from the day it opened in 1989, O’Shea’s will exit the world with the slightest of whimpers, but it will leave with one important question: Will the property replacing it be any more relevant? But first, a proper epitaph for O’Shea’s. It’s tempting to be sentimental when older, cheaper casinos close on the Strip so that new investments can sprout up in their place, but O’Shea’s deserves no such appreciation. 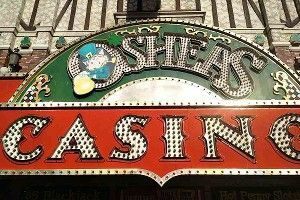 It lacked the class of the Desert Inn and the smoky history of the Sahara, casinos that were worth missing upon their closure; O’Shea’s was the brainchild of some miserable marketing machine looking to capitalize on the lowest common denominator. The tagline for the MGM Grand was recently “Maximum Vegas”; O’Shea’s was and is Minimum Vegas, a half-assed version of what you can find in much better shape everywhere else in the city in one big room. There are cheap outlets selling $3 T-shirts and $10 handbags, a food court featuring exotic dining options like Burger King, and small pits with slots and a limited selection of table games. 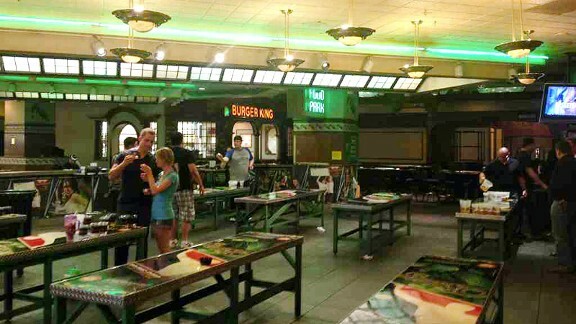 It eventually developed a small niche by becoming the first casino (to my knowledge) where you could actually play beer pong on the casino floor. My friends and I longed so much to play the Great American Sport on our first trip to Vegas that we stole cups from the Starbucks at MGM, laid them on a pair of ironing boards, and used the tiny wrapped bar of facial soap as a replacement ball to play beer pong in the adjoining door between our rooms. That marketing machine wasn’t all that dumb. I went to O’Shea’s on Monday to see if it lived down to my memories, and it was every bit as crummy as I remembered. The beer pong games were still going: For $23.50, you got cups, Ping-Pong balls, and two pitchers of beer. The lines of teams waiting to play that I remembered from five years ago were replaced, though, by empty tables short one group of mid-forties men who were calling it Beirut. (That’s the Great American Argument.) The LCD boards at the roulette tables that trick passersby into thinking that their number is due had been turned off, even at the two active tables taking bets. One had a girl screaming “SEVEN!” at the board in the hopes that her number would come up, horrifying the superstitious bettors at the craps table 10 feet away. The casino was already using the $1 chips from its sister casino, the Flamingo, in lieu of its own currency. The poker “room” did have a one-table tournament going, but the satellite tables sitting at the front of the casino remained mostly empty. I sat there once in a chair that was literally outside of the casino, with its hind legs sitting on the Las Vegas Strip; anybody with even the slightest bit of gall could have grabbed my chips and run into the crowd without any fear of repercussions, but that was just the sort of place O’Shea’s was. When I read a month before my move in August that a man was killed in a fistfight at a Strip casino, my initial reaction was “O’Shea’s.” I wasn’t wrong. That Vegas would have a frumpy casino is not news. The weird thing about O’Shea’s, though, was how valuable it really could have been. If you took a pin and put it directly in the center of the Las Vegas Strip, you might hit O’Shea’s. Nobody in their right mind would put a terrible property in the heart of the Strip in 2012, but 1989 was a different world for Vegas. When O’Shea’s was being planned and constructed, its owners likely saw it as a quirky boutique casino that would appeal to Vegasgoers’ seemingly endless love for tacky kitsch. Unfortunately, during that same year, the Mirage opened up on the other side of the street and began Vegas’s mega-casino era. O’Shea’s was almost an instant eyesore. As enormous resorts began to sprout up around the strip, kitsch was replaced by opulence and the demographics of the average Vegas visitor changed dramatically. O’Shea’s had been born at exactly the wrong time and spent its entire existence as nostalgia for an age yet to come. and can’t help but be disappointed. Over that time frame, the company has spent billions of dollars to collect a gigantic strip of property in the center of the Strip. In addition to O’Shea’s and its adjoining namesake property, which opened in 1972, Harrah’s bought the similarly woebegone Imperial Palace in 2005 and then acquired the Flamingo when it bought Caesars Entertainment a year later. In 2007, the company finished its land grab by trading 24 acres of undeveloped land elsewhere on the Strip to Boyd Gaming in exchange for the casino equivalent of an expiring contract, the deed to the aging Barbary Coast, which Harrah’s rebranded as Bill’s Gamblin’ Hall. That final move gave Harrah’s a mammoth block of property stretching all the way from Flamingo Road to the Venetian, a half-mile of land directly across from its marquee property (Caesars Palace) on one of the world’s most expensive avenues. And furthermore, the properties they had acquired had been open for an average of nearly 34 years; with the rest of the Strip having seemingly been rebuilt in the prior decade, it seemed natural that Harrah’s would tear down its aging casinos and build a gleaming, modern property that would serve as the company’s answer to CityCenter, the multi-billion-dollar destination built by rival casino magnates MGM. And then the economy happened. The mega-casino era ended overnight, with the unluckiest buildings literally left standing in mid-construction on the Strip, waiting to be finished. There was — and is — no way that Harrah’s could or would scrounge up the $10 billion or so in financing it would take to create their real dream mega-casino across from Caesars. So instead, after years of hemming and hawing on what to do with their huge chunk of land, they decided to raze O’Shea’s, re-brand the Imperial Palace, and create the Linq, a $550 million outdoor shopping and dining district that will exist in what was previously O’Shea’s and a walkway between two casinos. Its centerpiece will be an enormous Ferris Wheel, which could have a great view of a second Ferris Wheel being built simultaneously by an independent developer across from Mandalay Bay. Other properties designed to show off wondrous views of the Strip, like the observation towers at the Paris Las Vegas and Stratosphere, already exist and aren’t regarded as essential experiences. Maybe this will be an incredible addition to the Strip, but this sure smells like an NBA team acquiring a bunch of expiring contracts before using those contracts to acquire Larry Hughes. Harrah’s will likely retain the Linq as part of whatever monstrosity it eventually builds on that end of the Strip, but it’s unlikely to become an important destination for Vegas visitors, even if it offers beer pong. O’Shea’s ended up being anachronistic till the very end. It’s the first casino in several years to close down and be replaced by a new development, as the Sahara remains standing with its signage intact after being shuttered last year. Most of the closings in Vegas these days revolve around the endless cycles of ultralounges and entertainment options being moved in and out of assorted properties. The MGM Grand, which once had visitors walk in the front door through a lion’s mouth, closed its lion habitat over the winter. The Tropicana one-upped them, though, by replacing its Nikki Beach day-club brand after one summer with an in-house pool club named “SPF.” Although they produced billboards and signage advertising SPF for this upcoming pool season, the casino recently announced that they would be re-branding their pool experience as Bagatelle, meaning that “SPF” closed before it ever actually opened. O’Shea’s deserved such a fate.